Grange Park was initially made up of a small group of houses and shops built for affluent families mostly moving out of inner London suburbs. These shops and houses were centred around a new railway station, which opened on the 4 April 1910. The Grangeway shopping centre was described as architecturally superior to any other shops north of the Thames and the flats above as compact and convenient. The builder Richard Metherell, responsible for creating Grange Park, came from Devon to London in the 1870s as an apprentice builder, joiner and cabinet maker. He was very soon promoted to looking after important work in the City and West End. He then formed his own company R Metherell and Son, and began buying up land in Muswell Hill and became one of the first speculative builders in the area. In 1906 he bought the Old Park Grange Estate from Lord Currie. Old Park Grange originally served as a hunting lodge and stood just South of the junction with The Chine on the top of the hill overlooking the valley. With a number of additions, it was latterly known as Pike’s farm, the last resident farmer being Franklin Pike. On its north side, Old Park Grange adjoined the grounds of Chase Park another large house situated at the northern end of Old Park Avenue which was demolished to make way for the railway extension from Enfield Chase to Hertford North. Lord Currie, whose family were well known bankers in the City, was the last owner of Old Park Grange. It was demolished in 1913. 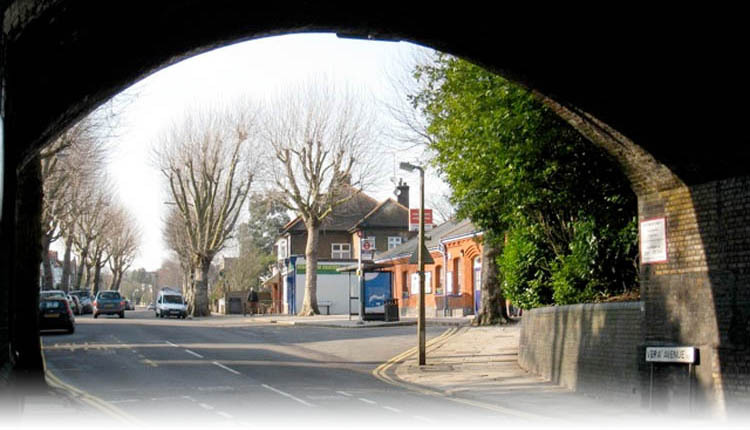 At the turn of the century Mr Metherell began straightening and widening the lower end of Green Dragon Lane building between Bush Hill and Old Park Ridings. Then, in conjunction with his son, constructed the roads Old Park Ridings, The Chine and The Grangeway, including two bridges over Salmons Brook. Richard Metherell lived at Elmscott House in Bush Hill, so was able to supervise the building of his new Grange Park Estate. The Metherell houses were built in the Arts and Crafts style, with immense charm and character with many features from the period. With the new Grange Park Station operating from 1910, the development continued at a pace until the outbreak of war in 1914. A number of early post-war and modern buildings and developments have been added over the years. Grange Park Preparatory School is housed at 13 The Chine. It was opened in 1924 by two sisters Mary and Louie Billings, they retired from joint headship in 1955. The site of the former village hall was later incorporated to house the lower school. The original Methodist Church in the Orchard was opened in 1921 when the land was still used as an orchard. Many more Methodist supporters resulted in the Marshall and Hood development of Park Drive and Grange Park Avenue and later Cheyne Walk. This prompted the Trustees to open a fund in 1937 and in 1938 the foundation stone was laid for the new Church. A temporary church was built on the site of St. Peter’s in the 1920s. However, it soon became clear that a more permanent structure was needed with the population in the area expected to reach 7,000. The foundation stone for the present church was laid on 1 June 1940, with the country in the grip of war. The remaining area was gradually built up with excellent local facilities. Today the area is still extremely sought after and retains its warmth and village-like feel. Grange Park Primary School was built in 1952 as a separate Infant and Junior School. The two schools were amalgamated in 1987 under one headteacher. The area continues to flourish and part of it has now been designated a Conservation Area.